Beloved One, Life has its twists and turns but rest assured if you get lost, I will always come find you and bring you home. My heart is happy when I think about you. My heart is overflowing with joy each time you say my name. My heart rejoices when you sing my praises and lift up your heart in prayer to the Father. I am well pleased with you, my Child. You may not be happy with yourself for one reason or another, but I am happy with you. Why? Because I love you like you could never even imagine and my love for you is unconditional. You put conditions on yourself that make you feel disappointed in yourself. Chin up, my friend, because there is so much about you that is beautiful and wonderful. Trust me, I know, because I know you completely. And I wouldn’t have created you any other way than I already did. I have great plans for you. Plans that will bring great joy to your heart. Don’t let the business of the season deter you from setting aside some time to spend with me. I am always eagerly awaiting your arrival. 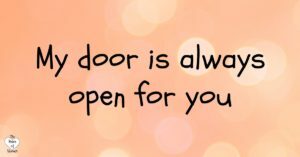 Just knock, my door is always open for you.